SAN FRANCISCO: The Nissan Pathfinder is a serious SUV, not a pretender like some of its competitors in the near-luxury SUV market segment. Watch the nightly news long enough, and youre bound to see white Pathfinders with UN painted of their roofs. Four-wheel-drive models are really meant to be driven off road over very rough terrain. While the 2002 Pathfinder got a revised front facia and grille, it still has a less "Tonka" truck look compared to the 2002 Nissan Frontier and Nissan Xterra. The Pathfinder now comes in two trim levels, SE and LE, with each available in two- and four-wheel-drive. All Pathfinders are now powered by a 3.5-liter, dual-over camshaft (DOHC), V6 engine that comes in two versions and is basically the same engine used in the highly acclaimed Nissan Maxima. One version used with the five-speed manual transmission produces 250-horsepower at 6,000 rpm and 240 ft-lbs of torque at 3,200 rpm. The manual transmission is available in the Pathfinder SE only with 4WD. All other versions feature a four-speed, electronically controlled automatic transmission. Here the engine is rated at 240-horsepower at 6,000 rpm and 265 ft-lbs at 3,200 rpm. While noted for competent off-road capability, the Pathfinder has near luxury car road manner that comes from the Pathfinders mature and refined engineering. While not all that advanced, the Pathfinders proven mechanics do a very good job. Acceleration and hill-climbing is excellent, though I didnt drive a fully loaded vehicle or towed anything. When properly equipped, the Pathfinder can tow 3,500 pounds with the manual transmission and 5,000 pounds with the automatic transmission. The brakes, front discs and rear drums fitted with standard ABS, stopped the Pathfinder well. The Pathfinders Monoframe unitized body integrated with a ladder frame results in a very solid feel with maximum rigidity against flexing and torsion stresses. Handling and ride is nearly car-like, a tribute to the independent front suspension using MacPherson struts and a 5-link coil-spring rear suspension with rigid axle and stabilizer bar in the rear. Power rack-and-pinion steering is used. An on-demand, part-time, shift-on-the-fly 4WD with a two-speed transfer case is used on the 4WD SE Pathfinder. The 4WD LE uses a fully automatic, push-button All-Mode 4WD System. For maximum off-roadability, there is an optional viscous-coupled limited-slip differential for $249. Two-wheel-drive Pathfinders are rear wheel drivers. The EPA numbers are: 4WD Manual -16 mpg City/18 mpg Highway, 2WD automatic  16 mpg City/19 Highway and 4WD automatic - 15 mpg City/19 mpg Highway. Fortunately, the fuel tank on the thirsty Pathfinders holds 21.1 gallons. Prices for the Pathfinder start at $27,189 for the 2WD SE and go up to $32,039 for the 4WD LE. Of course, you can load the Pathfinder with luxury and high-tech electronics like leather package at $1799, entertainment center with DVD and roof-mounted LCD screen at $1299 and Navigation system at $1999. The base SE come very well equipped with standard features including air conditioning, cruise control, power doors/windows/locks, tilt leather-wrapped steering wheel, AM/FM/CD, remote keyless entry and heated power mirrors. The LE adds as standard features like power glass sunroof, automatic temperature control, Homelink Universal Transceiver, titanium-color running boards, Bose audio system, wood-toned trim and halogen fog lights. The LE has 17-inch wheels and tires versus 16-inch ones on the SE. The full-size spare tire is mounted underneath the rear so it doesnt impede on interior space. Like most of the current Nissan products, the Pathfinder has easy-to-read, black-on-white instruments. If you want an upscale SUV with all the requisite goodies and creature comforts that rides and drives/rides like a good passenger car, the Pathfinder represents excellent value. 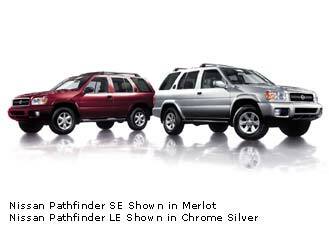 Incidentally, the Pathfinder shares its platform, engine and mechanics with the Infiniti QX4, luxury SUV.